← Lychee, rose and pomegranate panna cotta; A birthday well celebrated! 1. The turning of the leaves is kind of a magical moment when all of the sudden you are surrounded by rustic yellows and reds. 2. The colder weather is a constant open invitation to cosy your life up. Making a love nest, even is it for one, is very high on my priority list these days. 3. Time for comfort foods! I just love those two words put together. Comfort and food. Yeah! Spending more time with family and friends cooking and eating is so part of this season. 4. The canals in Amsterdam look so romantic when it starts getting dark earlier and all the pretty holiday lights are on. 5. I will soon celebrate another birthday. 6. Nothing beats coming home after an uncomfortably cold bike ride to a warm house and a cup of home brewed chai or a reviving soup. 7. I just loooove Christmas (hate Sinterklaas, sorry folks but as a black person living in Holland most of my adult life I just really do not believe zwarte piet is still the right way to go ano 2013! And please don’t tell me it’s a tradition. So was women not being allowed to vote some decennia back.) From the decorated trees, to the gifts, to the carols and the dinners. I just love it all. 8. Watching my 4 year old nephew enjoying himself in the snow (while I sip from a cup of hibiscus and ginger tea from behind the window, hi hi!). 9. 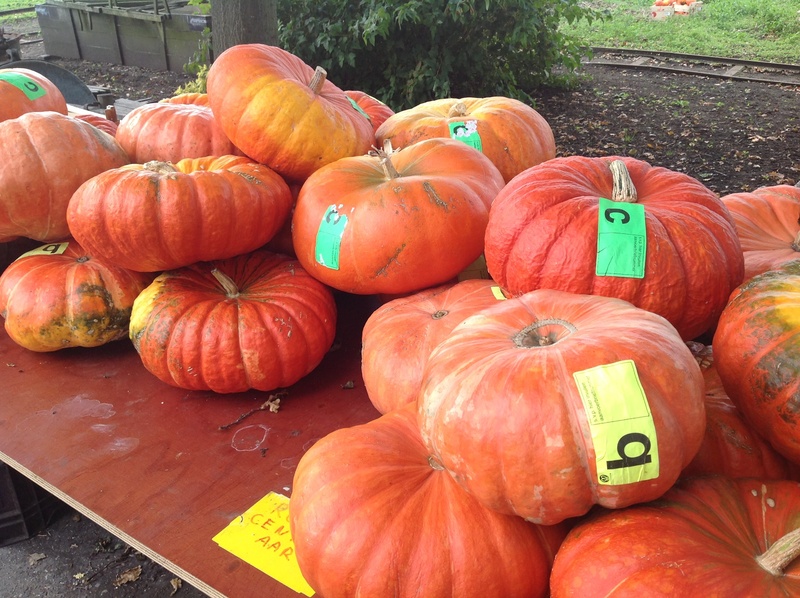 The food markets are overflowing with luscious fall produce; like super sweet pumpkins in all shapes and sizes. 10. Autumn and winter are cool cause I have spring to look forward to. So, phew! I feel better already. In honor of this season here is a soup that tastes good, looks good and has Holidays written all over it. It includes pumpkin which is perfect to lower Vata plus loads of spices such as nutmeg, cinnamon and cloves whose enticing smell immediatly bring X-mas to my mind. For an extra boost I have added chia seeds which make the soup very satisfying and give you some much needed extra energy as well. 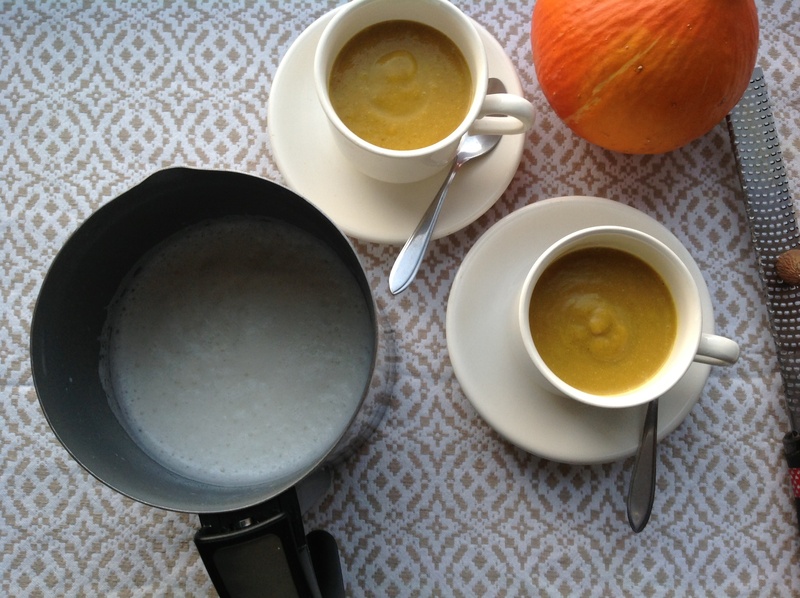 The soup is a real tridosha affair, balancing for all three Ayurvedic types. The coconut foam on top gives it an elegant touch and is especially good for Pitta’s. 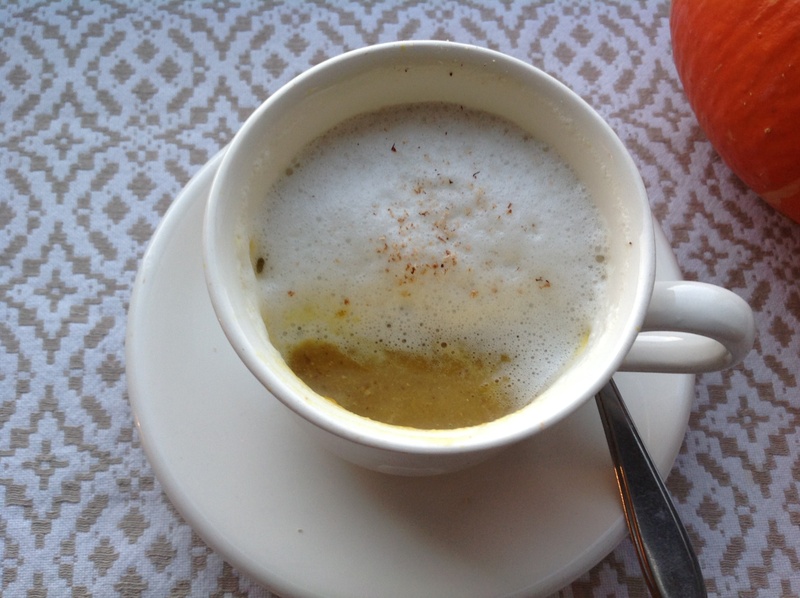 Kapha’s may want to use only soy milk for foaming and leave out the coconut milk. And Vata’s could substitute the coconut milk for almond milk. If you don’t have a fancy pancy cappuccino milk frother do not despair. Just heat the milks to just below boiling point and foam them with an immersion blender instead. Or put in some elbow grease and use good old mister whisk to beat the living daylights out of your milk mixture. It won’t foam as much as with the machine but you will get close enough. Now go and make your love nest, bundle up and take a long walk along the beautiful Dutch canals, come home and serve yourself (and your potential beloved) this love potion. I guarantee you won’t want the season to end. In a medium sized pan fry the onion, garlic and ginger on medium heat in the ghee until the onion is translucent. Add the turmeric, cumin, cinnamon and cloves and fry 2 more minutes. Now add the squash, stock or water and the chia seeds and bring to the boil. 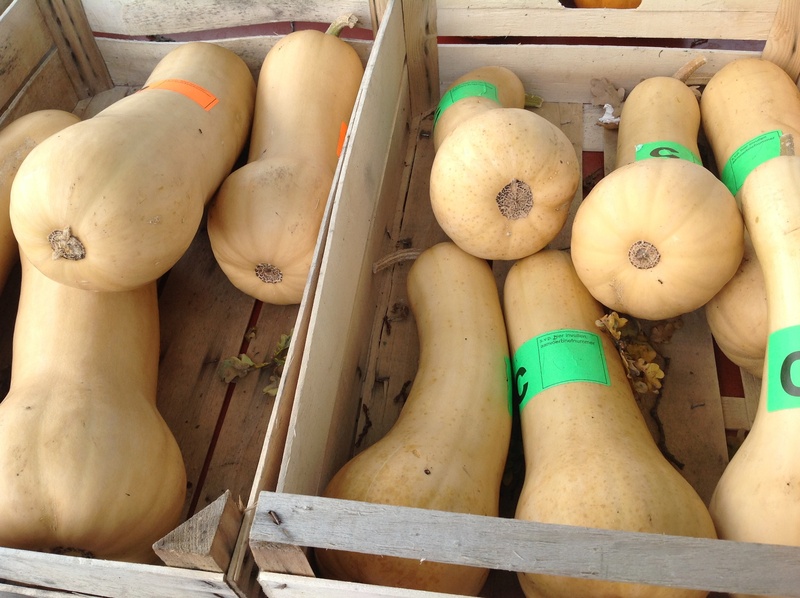 Lower the heat and simmer for 15 – 20 minutes or until the squash is very soft. When pierced with the tip of a knife the knife should go right through without any resistance. Take the pan off the heat and puree with an immersion blender or in batches in a kitchen aid. The soup will be quite thick which is good. You need some thickness for it to hold the foam on top. Season to taste with maple syrup, salt and pepper. Mix the coconut milk really well with the soy milk. Make sure it is totally lump free. So if needed give it a quick but thorough mix in a blender. Now pour the mixture in your cappuccino foamer (Mine has a maximum capacity of 500 ml a time. Please check yours to see what your maximum capicity is). As I mentioned before if you do not have a milk frother, heat the milk just under boiling point in a pan. Foam it with an immersion blender or whisk. 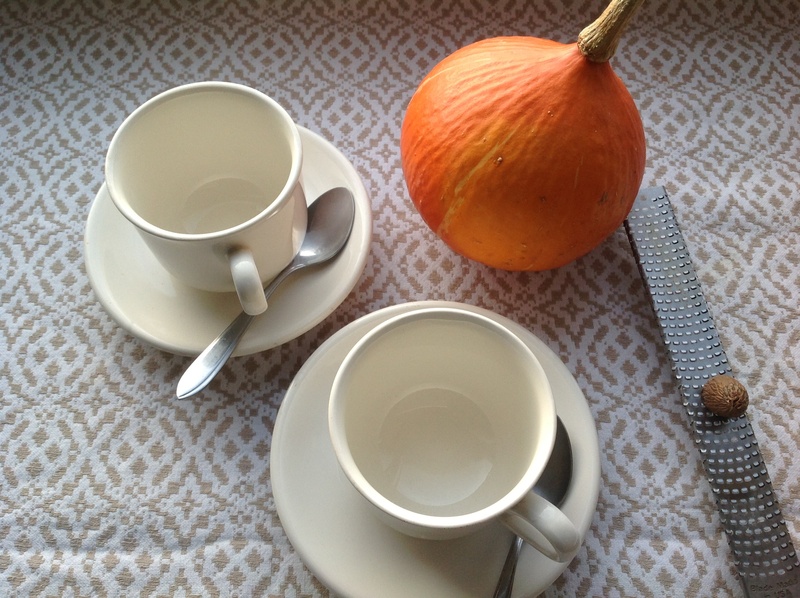 Fill warmed cappuccino cups 3 quarters full with the soup and top with a dollop or two of the coconut foam. Finish with a grating of fresh nutmeg. What a touching story. I heard something inspiring this week which I want to share with you: “when I leave, I don’t miss anything because everything that I care about I carry in my heart”. I find it always comforting to know that home is within me. Thank you Susan. That is a very beautiful quote.